This is the trip for those who want to experience the challenge and delights of the Simpson Desert but are not able to make the complete crossing to Birdsville. 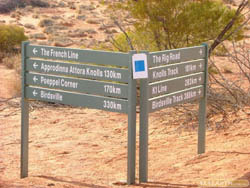 This includes people travelling from the Red Centre along the Oodnadatta Track possibly with camper trailers and off road caravans, and those who are not set up for prolonged desert travel. As these are the only fuel opportunities the track notes and Gps file start at Mt Dare and ends in Oodnadatta almost 550 km later, which highlights the remoteness of this region. Although 420km of this trip is easy in dry weather on mainly major dirt roads and good tracks, the 130 km “saucepan” section in the Simpson Desert Regional Park is tougher with the 37 km on the French Line extreme if the track is done in an anticlockwise direction. The dunes are steeper on the eastern side and years of id10t drivers with tyre pressures too high and questionable driving techniques have damaged the track severely adding to the challenge. A Desert Parks Pass is required which allows entry and camping for one year into many SA outback parks I suggest overnighting at Mt Dare which has fuel, hot showers, food etc before commencing this trip. On the way to Dalhousie Springs remember to collect firewood for two nights. Spend a couple of hours exploring and swimming here in this wonderfully warm natural mound spring before heading east to Purnie Bore where there is a thermal hot shower and a toilet. Set up camp for two nights. It is OK to tow trailers to here but I suggest larger vans be left at Dalhousie Springs. Purnie Bore has been partially capped but there is still an artificial wetland to explore and the wildlife it attracts. An early start is suggested as although there is only around 190 km 4wding for the day,it will take up all of it, with the 37 km horror stretch on The French Line taking almost 3 hours. Follow the French Line track for 29 km and turn right into the Rig Road for 15 km to reach the abandoned Mokari 1 oilwell. Head east for 50 km over the dunes and continue a further 2km past the Rig Road intersection onto the WAA Line track to Lynnie Junction and turn left and north onto the Colson Track. This is followed in the interduneal trough for 20km to the French Line where the fun begins when the left turn is made to head west along the French Line. The first dune to conquer is enormous and the challenges continue for hours. Eventually Purnie Bore is reached for the night. Time to reflect on the achievements of the day over a quiet ale or three...The next day backtrack to Dalhousie Springs for a final swim and head south to Dalhousie ruins where grazing and agriculture was attempted in the past. Further on are the ruins of the Pedika siding on the Old Ghan Railway and then finally Oodnadatta. The Pink Roadhouse is unique as has everything you need other than alcohol. From here the Oodnadatta Track heads west to the Stuart Hway or south east past Lake Eyre to the Flinders Ranges and then civlisation. The turnoff to the very photogenic Painted Desert at Arckaringa is 6 km south of Oodnadatta.